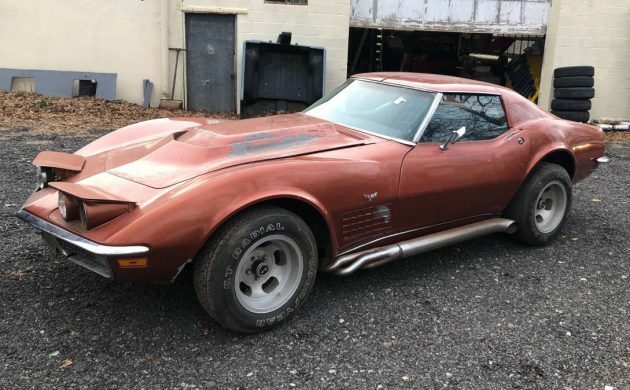 Personally, I can’t imagine having a car like this 1968 Corvette and leaving it sitting in a shed for the best part of 35 years, but that’s what has happened to this car. 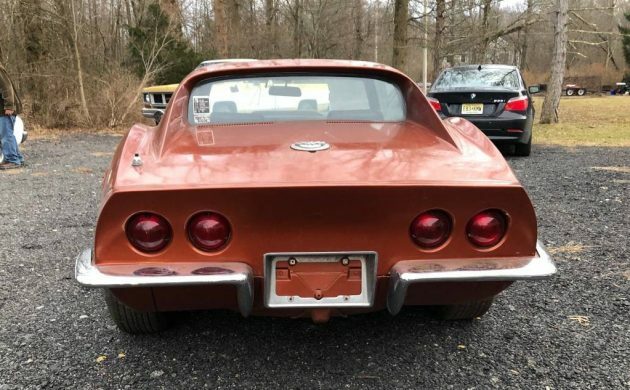 The owner has decided to part with it, so if you would like to park this in your shed instead, it is located in Armonk, New York, and is listed for sale here on Craigslist. We’re a bit short on photos for this one (we only get three), but what we do know is that it is a 1968 model that has been fitted with the front clip off a 1970-1972 model. We also know that it originally started life finished in Safari Yellow with a black interior before it underwent a repaint at some point into its current copper bronze color. We don’t know a lot about the interior, except that the car is fitted with power windows. The owner says that there is no rust or rot in the frame or floors, just a coating of surface corrosion. Under the hood are a 327ci V8 and a 4-speed manual transmission. There is no power steering or power brakes, but the car is fitted with headers and side pipes. The car currently doesn’t run, but the engine does turn freely. The owner says that he can see no reason why the car wouldn’t run. However, given the fact that the Corvette has been sitting since 1985, I’d probably want to give the whole thing a pretty thorough check before I tried to kick it into life. 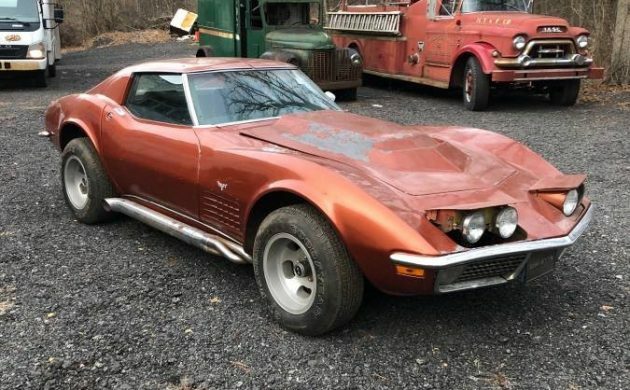 The owner says that this is a Corvette that will need complete restoration, and given how long it has been sitting, that’s probably a pretty fair assumption. The paint is pretty crusty and horrible, so a repaint will definitely be in order. Personally, I can see someone buying this and undertaking a frame off restoration. However, if someone is going to buy it, they will probably need to move reasonably quickly. The owner has set the price at $9,000 OBO but makes it clear that the price will go up if he needs or wants to perform any work on the car. Funny they mention 1 / 5,509 with blah blah blah, with the later front clip it is probably 1 of 1. I like the later coves better anyway. Could be a fair deal with a good look over. I am more interested in that green panel behind it. I say make a Hot Wheels tribute car, complete with the mags and redlines. I agree…it could be a good deal. It makes me laugh when I read “no reason why it shouldn’t run”. Hmmm, actually, there are a lot of reasons. What’s not to like? Corroded slotted-dish mags, warped aftermarket hood with paint peeling, headlights stuck open, unshielded and highly tarnished side pipes, and a price fully 3 times its worth. The only thing missing for me are the stickers in the back window – “Wrap Your A$$ in Fiberglass” & “Gas, Grass, or A$$ – No One Rides for Free”. I actually lived across the hall from a dude with all of the above – the ‘Vette, the stickers – back in the ’70’s. It’s a vivid memory that’s hard to suppress when I see a C3 like this. Even the doors were replaced. 1968 had unique door handles. The replacement parts on this speak volumes. There is no VIN listed in the ad. I would think the seller doesn’t know what year car he has more than every part on the car has been changed. JK – I have not taken the time to look but I thought the 68 and maybe 69 had these (unique) doors with the push button on the face and the paddle on the top? I have owned 2 -72’s a 73 and those doors were all the paddle handle ONLY. Ok, wow, were do you start? Considering all that has been accurately mentioned so far. 1968 was a terrible first year in the sense that I think they made over 100 changes (tweaks and improvements) to the 69. So if you are going to restore this you want to factor in all these changes. Power windows but no PS or PB, kind of weird. Check the birdcage and the frame rails, on top of the frame, in front of the rear wheels. Pull the kick panels and if there is signs of rust and or moisture = not good news. No mention of the 327 being numbers matching. If not, not sure what to say on this one especially with the wrong front clip. Unless you are going to “Corvette Summer” this one or resto mod it, then have fun! The seller mentions a front clip replacement. I wouldn’t worry about trying to return this one to “original” spec, just make a road worthy driver. I’m concerned as to why it sits so high? Early C3’s typically sit pretty low. Later C3’s sit higher, to soften the ride. Would definitely want to personally inspect before buying.